The Hanoitimes� – Andy Ho, managing director and chief investment officer of VinaCapital, said Vietnam has a lot of great businesses to invest in and the economy is stable and growing. The revised Law on Securities is expected to create a wave of foreign investments in the country as it allows foreign investors to hold 100 percent stake of Vietnamese companies. Under the revised draft Law on Securities, which will be submitted to the National Assembly for approval next year, the foreign shareholding limit at local companies will be lifted from the current 49 percent to 100 percent, except for some cases, which relate to either international treaty with Vietnam being a member or other specialized laws regulating lower foreign ownership limits. Many foreign investors currently want to invest in Vietnamese companies through capital contribution, share purchase or merger and acquisition (M&A), but they are concerned about the foreign ownership restriction. With the only 49 percent holding regulation as currently, they aren’t allowed to take part in the companies’ policy making. According to Nguyen Thuan, CEO of financial data provider StoxPlus, removing the ownership cap will be a very encouraging sign for foreign investors. Echoing Thuan, expert Nguyen Thi Kim Chung from the Banking Academy, said that the new policy, if being approved, will be an institutional breakthrough, helping Vietnam’s stock market see surging foreign indirect investment flows in the near future. In fact, many foreign investors are trying to increase their holding at local companies and willing to do so if having chances. 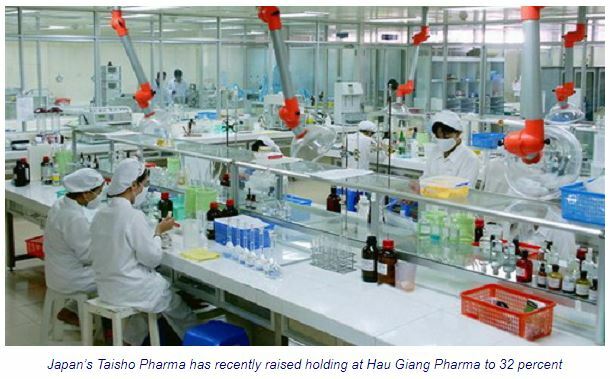 In the case of Taisho Pharmaceutical Holdings recently, for example, right after Hau Giang Pharma JSC (DHG) announced that it had completed the procedures to lift the foreign ownership cap, the Japanese firm proposed to purchase an additional 7.06 percent stake in the Vietnamese firm, lifting its ownership to 32 percent. Singapore-based F&N Dairy Investments Pte. Ltd. has consecutively registered to buy shares of Vietnam’s largest dairy producer Vinamilk (VNM) in a move to raise its holding at the Vietnamese firm. Most recently, the investor registered to buy an additional 17.4 million VNM shares via put-through transactions or order-matching transactions on Ho Chi Minh City Stock Exchange from October 19 to November 16. If successful, F&N Dairy will increase its holding at Vinamilk from 17.31 percent to 18.31 percent. According to experts, foreign investors have paid their attention to capital contribution, share purchase or M&A with Vietnamese firms as they see the firms having high growth prospects while the government is making great efforts to improve the country’s business and investment environment to support firms. Besides, foreign players also prefer this investment form as it can help them rapidly step in the Vietnamese market. The advantage of this investment form is that investors do not have to apply and wait for investment licenses. In addition, they can start working immediately without having to spend time for learning and researching the market. Andy Ho, managing director and chief investment officer of VinaCapital, said Vietnam has a lot of great businesses to invest in and the economy is stable and growing. Therefore, a lot of foreign investors still want to invest in Vietnamese firms. Sharing the same view, Jiun Park, senior deputy managing director at the Korea Trade Investment Promotion Agency, revealed that many South Korean small and medium-sized firms have enquired about the process of capital contribution or share purchase in Vietnamese firms. Figures from the Foreign Investment Agency under the Ministry of Planning and Investment showed that after pouring a record high of US$10.2 billion into Vietnamese firms through M&As last year, foreign investors continuously spent US$6.3 billion on 5,342 deals to contribute capital or acquire shares in local firms in the first ten months of the year, up a whopping 35.8 percent year-on-year.